The Revenger X has heating insulation layer and a variety interchangeable GT cores. OMNI board 2.2 chip inside makes your kit perfect wroking. 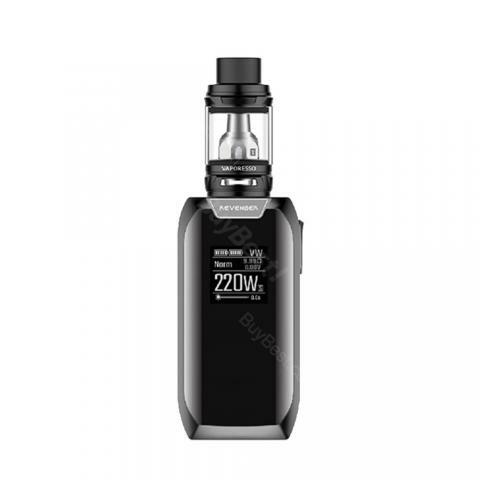 Vaporesso Revenger X TC kit is the upgraded version of Vaporesso Revenger Kit. Compared with the old version, the Revenger X has heating insulation layer and a variety interchangeable GT cores. It has OLED 0.96 inch which will give you a clear visual effect and a wonderful user experience. OMNI board 2.2 chip inside makes your kit perfect working. You can choose different capacity 2ml or 5ml, 5 colors in stock in our store. • You also can buy the replacement GT Coil/GT8 coils in BuyBest. Practicality, easy to use Quality and design Easy installation OMNI board 2 gives you the option to change wattage in TC mode, which the previous board didn’t. Large, clicky firing button. Comes with a compliant NRG tank. Atomisers up to 28mm sit nice and flush without overhang. Option to get it in red, blue or black. Big and strong mod. Magnetic door for battery removal. Clock needs to be reset daily while charging batteries externally. I don't use the clock feature at all because of that. Doesn't fire approx 1/30 times when I hit the fire button. Overall extremely satisfied with my purchase. There are many functions, but simple to use! Good ergonomics! The comfortable in my hand, and large enough for gravity! High-quality products! The disassembly is simple, the battery fits very well! The display shows a lot of information, but it can be read. Very good atomizer for Dl use. Good taste and steam do it. The coil works well for a long time. ! The development is quality! Very good price! Fast shipping and good comunity! Nice touch screen. Fastastic fire and battery useing! Very strong megnetic! Thank U! This vaporesso kit is excellent. It definitely can work perfectly. I especially like the adjustable temperature, making the vaping experience amazing. This vaporesso kit absolutely looks fancy and elegant. Its also quite compact and thus convenient. Really love it. Дизайн Vaporesso Revenger X TC Kit мне понравился и цена ниже чем у других магазинов! I've wanted this Revenger X kit for a long time, for some reason, I got it lately, it has got nice color, sleek design and works very well! Device is awesome, easy to assemble, good-looking design and menu is able to be customized. I'm very satisfied with this revenger x kit, besides, it's very light, very nice kit for beginners. I bought it at a discounted price, all things are good, so damn good! !